I am a violin teacher and a concert organizer. 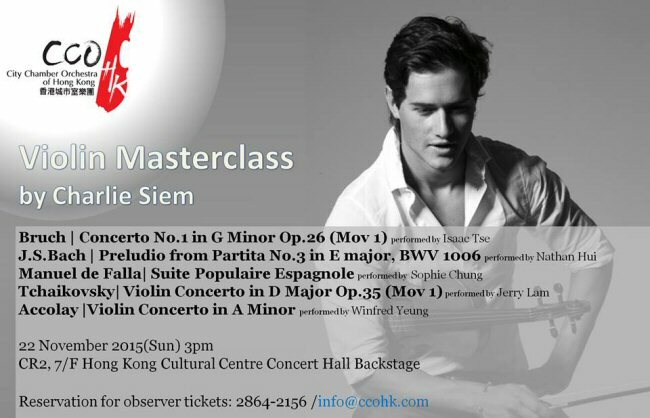 On 22nd November, 2015, I attended a masterclass at Hong Kong Cultural Centre, arranged by the City Chamber Orchestra of Hong Kong and led by Charlie Siem. Weeks before his arrival in Hong Kong, I became aware that Charlie was the darling of the fashion world. I also learned of his penchant for sharing photographs and videos via social media. However, I was not ready to form an opinion about his musicianship before going to the masterclass. My son was among the five students selected to perform for him, so I hoped that the experience would be enlightening. I dutifully reminded my son to practice for the big day. At the back of my mind, however, I had a few reservations. I have spent years observing violinists of all ages at private lessons, masterclasses, competitions, rehearsals and performances. I collect recordings of great violinists, past and present. I regularly glance over musicians' biographies, and I always read between the lines. In recent years, very few violinists have impressed me sufficiently to make it onto my list of favourites. My maternal instincts prompted me to do a bit of research about the man who would be teaching my child. After clicking on a few of the search results for "Charlie Siem" on Google and YouTube, I wondered whether this photogenic model was a verifiable virtuoso who could fulfill my exceedingly high expectations. The day of the masterclass finally arrived. I remained somewhat guarded towards the fresh-faced celebrity, even as he settled down on the chair beside me to observe the students' performances. At the time, I almost could not bring myself to accept the fascinating paradox that he was supposed to be. How often does one encounter a self-professed violin geek who also happens to be a devastatingly suave style icon? Yet, as I watched him discussing technique and demonstrating on his 1735 d'Egville Guarneri del Gesu, I was struck by the irony: if we were living in a world that valued substance over packaging, Charlie's musical prowess would elicit more sighs of rapture than his modelling portfolio. All afternoon, he guided the students and played his exquisite instrument as convincingly as any of the legendary soloists I had admired over the years. If there was a difference between Charlie and other distinguished violinists who had visited our shores, it was in his ability to put the students, their parents and other observers at ease. He remained perfectly poised, congenial and articulate throughout the post-masterclass Q&A session, even when the first question -from a love-struck fan somewhere in the back- was worded in a way that would have made any man blush. However exhausted he must have been after three intense days in Hong Kong, Charlie still appeared delighted to fulfill the requests of every man, woman and child who joined the long queue for pictures and autographs after the class. By the time he waved an aristocratic goodbye and strode out of the room with his priceless violin, my preconceptions were stripped away. I ultimately recognized that he was a bona fide musician who deserved the respect and support of the classical music establishment. I have since purchased two of his studio recordings, and I look forward to hearing more from him in years to come. Words cannot describe all the special qualities I hear in his playing or express the depth of my gratitude for his first visit to our fine city. That is why I have chosen to build this website and the Charlie Siem Unofficial Facebook Page in his honour. The launch date of this unofficial site coincides with Charlie's 30th birthday. The internet is bubbling over with information and media files for all who wish to become better acquainted with Charlie Siem and his work. Although Charlie is an ideal ambassador for the violin virtuoso repertoire, his exceptional musicianship is too often eclipsed by his impeccable couture and irrepressible charisma. It is my sincere hope that more fellow musicians, educators, arts administrators and connoisseurs of music will try, as I have, to close their eyes and open their ears to what this extraordinary performer has to offer. "...if we were living in a world that valued substance over packaging, Charlie's musical prowess would elicit more sighs of rapture than his modelling portfolio." "How often does one encounter a self-professed violin geek who also happens to be a devastatingly suave style icon?" "Weeks before his arrival in Hong Kong, I became aware that Charlie was the darling of the fashion world."